Telstra Broadcast services - Australia. Sydney, December 2018: For the first time in the history of Australian baseball, Telstra Broadcast Services has begun live broadcasting of the Australian Baseball League (ABL) 2018/19 season across the Asia Pacific region. The broadcasting agreement will see Telstra televise a minimum of 40 games of the ABL regular season, as well as all playoff games to Korea, Taiwan, New Zealand and Australia. 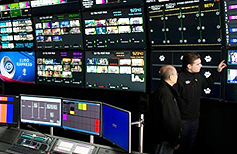 Telstra’s broadcast field operations team has installed on-site satellite uplink services at all capital city venues in Australia including Perth, Adelaide, Melbourne, Canberra and Sydney. Geelong near Melbourne is also a key venue, as a Korean team is based there for the summer to play in the ABL. Baseball Australia Chief Executive Officer, Cam Vale, said the full suite of Telstra Broadcast Services offering was key to reaching the agreement. "This highly specialised delivery service and support will enable more international fans the opportunity to connect with the ABL," Mr Vale said. Head of Telstra Broadcast Services, Trevor Boal, said the deal reflected Telstra’s commitment and pride in delivering premium live sport globally. “On a daily basis, we work with the world’s top sports broadcasters, agencies and sporting codes to deliver broadcast content,” Mr Boal said. The agreement also means Telstra will provide bookings support, master control support, satellite capacity, up-linking, down-linking, switching and delivery to multiple rights holders. Telstra is also working closely with the ABL to provide advice and support on various forms of digital content delivery to further enhance the reach of the sport.